While it can be annoying, recovery is key to help your body prepare to move stronger and react quicker when on the field. We usually associate recovery to an injury, and while rest helps heal injuries, recovery is also needed for healthy bodies too. Recovery is essential to keep muscles from feeling fatigued or overworked, which can help prevent a potential strain or sprain. Recovery allows your body to get ready for your next workout or competition. Recovery goes beyond a post-workout stretch. Follow these recovery hacks to boost your game. Compression sleeves and support have a dual-purpose; they help achieve top performance during movement and aid in quick recovery after a workout or competition. Many times, athletes feel sore after a workout or game because they gave it their all. Compression support, like our Trizone™ bracing collection, delivers support to the muscles and joints as well as compression to help improve blood circulation to the overworked muscle or tendon. *Our Trizone™ products offer three distinct compression zones which include: a stability zone with strategically placed injected silicone to provide support for the knee joint and the benefit of enhanced proprioception, a compression zone which improves circulation and provides mild support to the joint structure and surrounding muscle tissue, and a comfort zone that provides lighter compression for enhanced fit and helps improve range of motion. 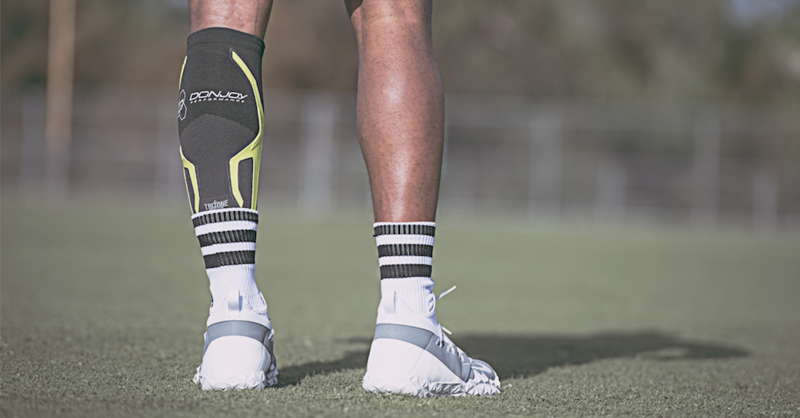 This combination of bracing and compression can help an athlete recover quickly and be ready to perform their best. Recovery from exercise is crucial for athletes, especially when repeating movement. In competitive situations, where athletes compete many times over the span of several days, enhancing recovery efforts may help with the competitive advantage. Cold therapy or Ice therapy can help athletes with the recovery process because ice can help reduce inflammation and swelling of the muscle or joint that was overworked. It can get the body ready for performance, especially if it’s soon after the workout or competition. Cold therapy is one of the first steps to take in post-workout recovery or injury to help reduce swelling and inflammation while hot therapy can help alleviate muscle stiffness and soreness. According to the National Institute of Health, foam rolling can help alleviate muscle fatigue and soreness (delayed-onset muscle soreness [DOMS]) and improve muscular performance. Potentially, foam rolling may be an effective therapeutic modality to reduce DOMS while enhancing the recovery of muscular performance. Foam rolling can help rid lactic acid build up and get the blood circulating, which helps ease DOMS. It also helps loosen up tight muscles, which improves flexibility and range of motion. So, foam rolling a recovery technique to loosen worked muscles and get them ready for competition. PNF is a stretching technique that’s useful to help increase range of motion and flexibility. PNF increases the length of the muscle and increases neuromuscular efficiency, which helps improve range of motion. This technique is helpful for athletes to prevent injury because the push and pull technique allows lactic acid to flush out while strengthening the muscles and improving the flexibility. When PNF stretching technique is performed consistently and post-exercise, it increases athletic performance, along with range of motion, which can help prevent muscle strains or tears, according to the National Institute of Health. Recovery is essential to boost an athlete’s game, so it’s important to include at least one of these recovery tools to your post-workout or post-game rituals to aid in performance and to help prevent injuries. Note: It’s important to speak with your physician for proper diagnosis and before beginning any recovery program. WARNING: Cold therapy devices can be cold enough to cause serious injury. Read and understand all warnings and instructions for use before using any cold therapy device. Additional warnings appear in the instructions for use.